L-R: Harvest in Berroco Remix, Moraine (from Strange Brew in Cestari Mt. Vernon 2-Ply, and The Weekender in Blue Sky Fibers Woolstok. We had an amazing reception for our inaugural Intrepid Sweater Brigade last year. So we're back for Year 2. Running from January 26 to April 30, this workshop is designed for knitters with a solid grasp of knitting fundamentals (knitting, purling, binding off, casting on) who want to make their first sweater. If you’re a more experienced knitter who wants to make your first successful sweater, this is for you, too! There is no cost to attend Intrepid Sweater Brigade meetings; if you need assistance above and beyond typical drop-in capacity (for example, you need one-on-one help with stranded colorwork), we’ll be happy to make arrangements to do a private lesson at your convenience. Any sweater from the Strange Brew book - mostly pullovers with stranded-colorwork yokes; if you want to be brave and attempt your first steek to make a cardigan, we're here to support you! Additionally, Flax, Flax Light, and Harvest are all part of The Simple Collection, which are free and provide tons of online support and tutorials. The Weekender by Andrea Mowry - a worsted-weight pullover with TONS of technique-building potential: drop shoulders, tubular cast-on, slipped-stitch body detail, grafting ribbing, working with positive ease. $8 Ravelry pattern. 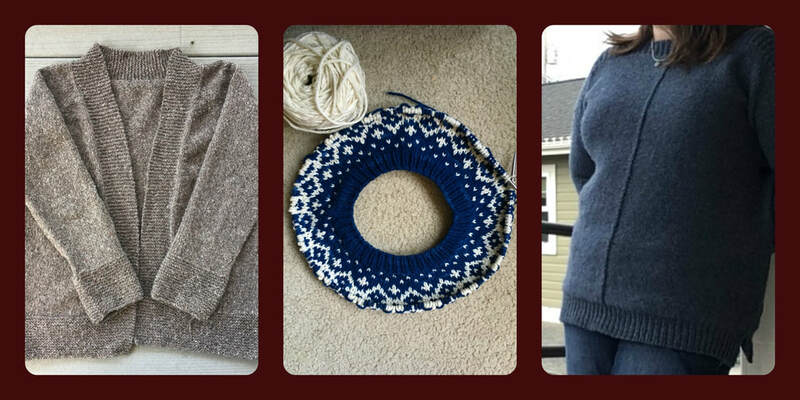 Want to join us for Sweater Brigade but have your own project in mind? Choose the "independent study" option, and work a pattern of your own choosing. The Intrepid Sweater Brigade will have two meeting times each week to accommodate multiple layers of your busy schedules. Attend one or both meetings each week as you see fit; skip weeks without worry as you need to! How do I get more information? How do I get signed up? Stop by and see us during normal business hours, call us at 360.631.5801, or email us at Lindsey@stillyriveryarns.com.